These are from Friday night at the Powell’s book club event. 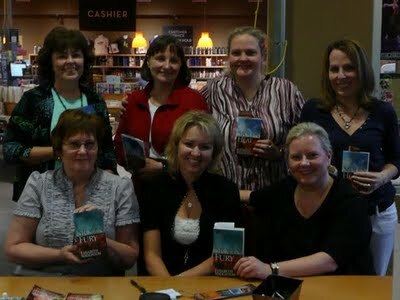 And this one is me with some of the Rose City Romance Authors. So after Friday night’s event I think I’m glad I’m having the vocal surgery. I talked more than I probably should have, but not more than any normal person. However, I was hating life later that night and the next day. My throat hurt, my voice sounded awful and the whole thing just reinforced my decision to get to the bottom of my vocal problem. I can’t go through life with this voice–not if I ever plan to talk to anyone. In other news…last night I had an epiphany on the wip! I don’t plot books out ahead of time…I sort of write into the mist, as I call it. But last night the ending came to me, which is SUCH a relief because I’ve been starting to stress on how I’m going to work this one out. I love it when solutions just pop into my brain like magic. I’ll probably be off-line a good portion of tomorrow while I’m having my surgery, but I’ll be back on Wed. to let you all know how it went. In the meantime…anyone have any good book recommendations for me? I think I may need something to read during my recovery tomorrow night. Since I’m book-less right now (I finished The Madness of Lord Ian MacKenzie and loved it) and have to go out today anyway to run a few errands, I feel a book store stop in my near future.